I’m fortunate to have a fair sized plot of land to do as much gardening as I want. But there are a lot of gardeners who used to have space but now live in a place where there is no where to plant a garden. And there are plenty of others who have never gardened before and long for a plot of soil to start gardening. More and more community gardens are popping up all over to meet this need. They are being started by churches, cities, towns, parks and rec departments other community groups. Most community gardens offer individual plots. It’s a place where you stake out your claim and no one else is allowed on your spot unless you say so. That means plot boundries are clearly marked so no one encroaches on someone else’s area Some community gardens are communal meaning everyone pitches in and work one big plot of land and all share equally. That however takes a special group of people to successfully pull that one off. Almost all community gardens charge a fee to help defray costs such as springtime tilling of the soil. In addition to land, most gardens provide access to a water source — although the most rugged ones may not. Sometimes compost and mulch is available for gardeners to use. You’re most likely to see that in gardens sponsored by city parks departments that collect large volumes of leaves in the fall. Generally the larger the fee, the more amenities provided. It’s quiet now but soon be buzzing at St. Mary Organic Farm community garden. Now’s the time to start searching for a community garden near you. Plots are normally rented out on a first come first served basis. Often plots are gone well before the gardening season starts. Early March would not be too soon to reserve your spot. Thankfully, the internet makes it fairly easy to find a community garden. Local MSU Extension Offices are a good place to start too. Community gardens are especially good for beginning gardeners because they are places where experienced gardeners are most likely to hang out and a novice can find a mentor. If you know of a community garden who has room for more participants, let us know in the comment section. Earlier this week I decided to move some of my chickens into the lower garden. That area is poorly drained and water sits there almost every spring. Since the last couple of summers were so damp and rainy, that spot was waterlogged for much of the growing season. I couldn’t plant anything. I couldn’t even till the area, so I let it go fallow. Right now the spot is dry. 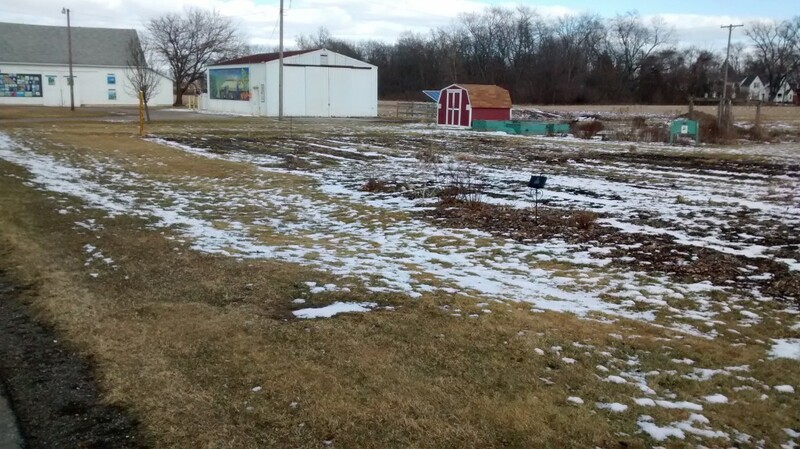 Since it has been so warm, the soil is not frozen and there is no snow cover so the chickens will be able to scratch to their hearts’ content. There’s an old garden shed in that spot that I sometimes use as a temporary chicken coop. And I have the area fenced to keep out deer, woodchucks and those wascally wabbits. It also keeps chickens in. The weeds in that low spot really took over after two years of non-use. Some weeds grew over three feet high last year. That will be a real challenge this spring. I’ll have to cut down all of that plant material and try to till it the best I can. 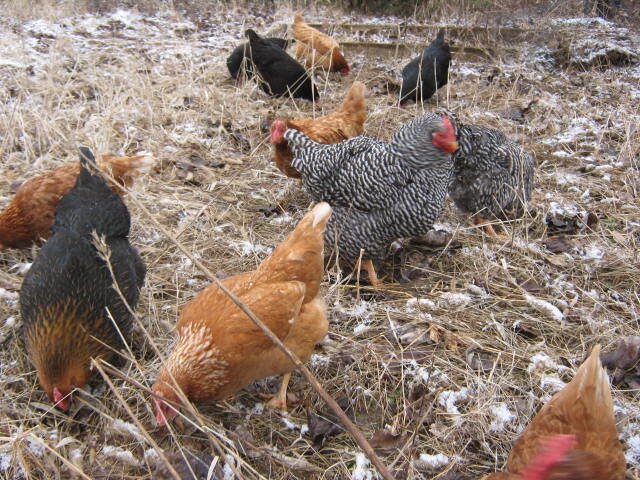 The chickens can help quite a bit by tearing into those tough weeds ahead of time. Scratching in the weeds is a chicken’s favorite pastime. So why even bother with that area? Why not turn into lawn or let it revert back to a wild area? Well, the National Weather Service is predicting a warmer than average spring and summer. They are also predicting below average precipitation, at least through spring and maybe well into summer. If it turns out to be hot and dry, my sandy-soil upper garden — which did very well last season– will probably be too dry to grow much of anything without a lot of irrigation. During past years when we’ve had droughts, my lower garden rarely needed irrigation until well into the summer. So that’s where I’m placing my gardening bets this year. If things change, I can always move the chickens back to their normal spot.